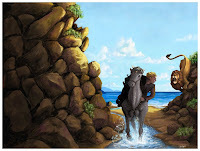 I'm going to "review" The Silver Chair and The Horse and His Boy in one post because, admittedly, these are my two least favorite titles in the Chronicles series. This post will probably be the shortest yet and I'm going to write it assuming you know the story line. If you do not, check out the synopsis of the Chronicles of Narnia which I posted earlier in the week. Highlight of The Silver Chair : Puddleglum! Jill, the main female character in this story sums up the character of Puddleglum nicely when she says goodbye to him at the end of their adventure. She says, "You sound as doleful as a funeral and I believe you're perfectly happy. And you talk as if you were afraid of everything, when you're really as brave as - as brave as a lion." Ford notes in Companion to Narnia that if the character of Puddleglum were to be allegorized, you could say that he is the "skeptical nature that we all need to keep us on the right path." Puddleglum is a man, er, Marsh-Wiggle, who is big on faith and short on good looks. He comes across as stupidly pessimistic but his gut feelings often prove accurate. He's a true blood Narnian and would rather believe in Aslan than not. Tried and true, he's a good companion for a tough journey and was a delight to get to know in this particular Narnia adventure. The Horse and His Boy is my absolutely LEAST favorite of the Narnia stories, even though it's the only glimpse we are granted into the Golden Age of Narnia when High King Peter sat on the throne. Otherwise, I truly find the characters of Shasta and Aravis to be rather boring. Despite this, my husband and I (ha! This will reveal something of us!) included this last passage from The Horse and His Boy in our wedding program (along with several other quotes, I might add! ): "Aravis also had many quarrels (and, I'm afraid even fights) with Cor (i.e, Shasta), but they always made up again: so that years later, when they were grown up they were so used to quarrelling and miking it up again that they got married so as to go on doing it more conveniently." Highlight of The Horse and His Boy : Shasta questioning Aslan why he (Aslan) treated Aravis in a certain manner. 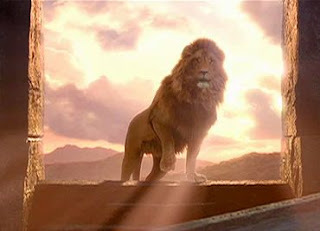 Aslan tells Shasta that it is not for him to know Aravis' story. We are only told our own story. How true is that (even when we don't like to admit it!)!?! It is not for me to know your story or anyone else's story. I don't get to demand answers from God for your problems and issues. Likewise, you aren't told about mine. I like being more concerned with what God is doing in other people. It's always way more interesting than what He is doing with me and somehow feels more productive to find out about you than to deal with myself. Aslan points Shasta in the right direction - towards his own journey and concerns that Aslan has for Shasta. That is all he needs to know. Fascinating! When I first read through these two particular books I didn't like them at all. This time I liked them, just not as much as the others. They don't draw me in in the same manner that the other books do but there are still valuable things to be gleaned from them. Although they do, in some ways, feel disconnected to me from the rest of the series, they do blend and I have to feel like it's my own fault I don't much care for them. I love your summation of The Silver Chair: "Puddleglum!" He is absolutely one of the best characters Lewis created, imo. :D I think I probably like the book a bit better than you, but Puddleglum's certainly the reason why. And YEAH!!!! Someone who (in comparison to the others) finds Horse and His Boy boring. I wouldn't say I hate it, because I still read it and get lots out of it, but I just don't find it as "adventuresome" as the others. I do like Shasta, and Bree is just cool. I would say, though, that I think you're right about how the book allegorizes stuff. There's probably a lot more blatant allegory to the Christian life in this book than any other (except Lion, Witch, and Wardrobe). I do remember being struck by those acutely Christian comparisons when I read it before. Gosh! I thought I was the only one who didn't like Horse and His Boy very much. Great review and I love the quote you included at your wedding!